One of my husband's biggest complaints is that the retail stores seem to skip from Halloween to Christmas and forget all about Thanksgiving. Even though I adore the Christmas holidays and love to decorate quite early, I have to agree with him. The holiday, which is all about giving thanks, and not too much about giving to shop keepers, seems to be a forgotten thing with retailers. The same can be said about jewelry items with these themes. Halloween jewelry is fairly easy to find and Christmas jewelry is plentiful all year round. But Thanksgiving...not so much. I had a look in my stores to see what I have left for this holiday and the pickings are indeed slim. I have had several cornucopia pins for sale, but they are all long gone. One very special item that I do have left is a wonderful 14K gold demi parure from the Robbins Attleboro Company. They have been in business since 1892 and produce very high quality jewelry. The demi consists of a charm bracelet and matching pair of clip back earrings. All pieces are set in 14K gold with multi colored enamelling on the cornucopia design. The set is not marked with metal content, but I tested it three times with my Mizar gold tester and it tested at 14K each time for the bracelet, bracelet charm and earrings. This lovely set is available from my Ruby Lane Shop - The Finishing Touch Vintage Jewelry. 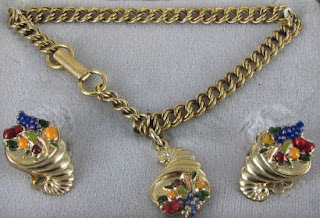 For more pictures and additional information about this 14K Gold cornucopia charm bracelet and earrings, you can click here. Priced at $699 (or you can make me a reasonable offer) - it is a chance to celebrate Thanksgiving in real style.